For hanging baskets, containers or in the garden Petunias bring long lasting color from spring right through summer. Most like to trail down a little so a hanging basket is ideal, however a pot of petunias on a deck, with the flowers allowed to cascade over the edge of the pot does look wonderful. 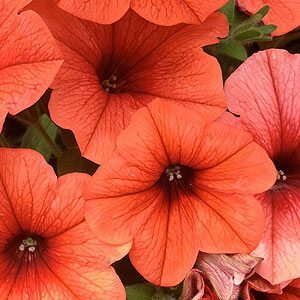 They are a plant that can be used as a filler in the border, plant in bare sunny spots between shrubs and perennials for a mass show of color. They are in fact a very popular bedding plant for mass displays in many public gardens. Best planted in spring, and in the border try for a mass planting. Most nurseries will sell both small punnets and larger trays from August through to Summer. In the garden a humus rich moist soil is best, full sun to a little afternoon shade and some protection from hot drying winds of summer. Petunias also require a frost free environment. We use slow release fertiliser and a water retentive potting mix. We also supplement with a liquid seaweed fertiliser. Deadhead to keep tidy and promote a second flush of flowers. Every year new varieties are released, new colours will never cease to surprise. You can buy petunias at most good garden centres and the larger hardware stores with nurseries attached. Look for the mounding varieties ‘Happytunia’ available in shades of pink.